There's a widely-held stereotype that Asians drive badly; anyone who's been in the parking lot of a Korean grocery store will not refute that. Inside, the story is pretty much the same; get out of the way, or you will be run down by a shopping cart - or a person. DH and I were meeting our friend LaRaine to try out Shin Chon Gardens, in Lotte Plaza, and decided to head out early and do a little grocery shopping before dinner. The Lotte mart was small, extremely crowded, and lacking the amazing array of Asian foods we were used to at the much more-interesting Han Ah Reum. We bought a few basics - fish sauce, rice noodles, baby bok choy - and beat a hasty retreat from that madhouse. If you read the Baltimore Sun review linked to the restaurant name above, you'll see that the service is good and that the staff speaks excellent English. Weeelll...they must have had some major turnover between then and now, because the service was abysmal and the English was just as bad. The food, however, was pretty good. We went specifically for the barbecue, so requested to sit at one of the special tables with a grill in the center of it. LaRaine and I ordered the bul goki (thin slices of marinated beef ) and pork belly, and also pa jeon (a large pancake studded with seafood and scallions) for the table. Hubby tried the dolsot bibimbap. In a few minutes, food started to arrive and was placed on the table higgledy-piggledy. Rain and I sat across from each other at one end of the rectangular table with a square grill taking up the center. 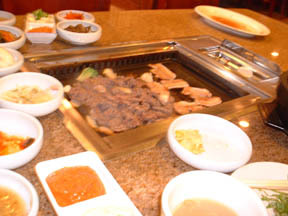 The location of the grill left little room for the many dishes that normally accompany a Korean meal, and our waitress chose to put most of them in the small space nearest to my end of the table, including Neal's miso soup. There were also two small trays bearing whole cloves of garlic and sliced chiles plus a blob of bean paste; a basket of romaine lettuce leaves; a bowl of thinly sliced scallion greens; small saucers of something that tasted like sesame oil with salt and pepper in it; about eight small dishes containing the panchan, (the vegetables and whatnot that always accompany a Korean meal); two small lidded metal bowls containing rice; a squeeze bottle of kochujang; a saucer of sauce for the pa jeon; and two small casseroles, one containing a beefy soup and the other with steamed egg. We were confused about the casseroles; were they sides for the bbq? If so, why one soup in one bowl for two orders? Double-dipping really isn't a problem for Raine and I - we've shared enough communal Chinese meals in which we've picked up food with chopsticks that had already been in our respective mouths. But still - weird. A waitron silently brought our meat, cutting the beef with scissors, and placed it on the grill in front of Neal, never indicating what we should do next. Do we cook the meat? Will they come by and tend it? It turned out to be a bit of both. When I decided the beef was probably burning on one side, I started turning it with my chopsticks, and Neal did the same for the pork, since he was the only one of us who could reach it. 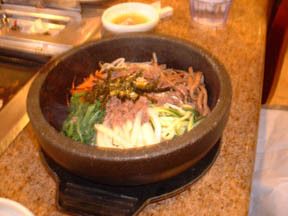 His bibimbap arrived, prettily arranged with bits of vegetable and an egg yolk, and he dug in, famished, while LaRaine and I busied ourselves with the beef and the pork, the steamed egg and the soup. I love Korean panchan. The variety of flavors and colors is a delight to the eyes and the tastebuds. At our late, lamented favorite, Purim Oak, the panchan was generous and refilled regularly. At Shin Chon, once the dishes were placed on the table, we were left for dead. There were some tasty things - the omelette-type things with zucchini, the spicy cucumber, the marinated radish - but nothing was special, and I missed my sigeumchi-namul (a spinach preparation). As we were scraping up the last bits of now-burned meat from the grill, our pa jeon arrived - big as a pizza, and crowded with 2" long pieces of scallion greens and nuggets of squid and small shrimp. It was crispy, greasy, and brown on the outside, and chewy on the inside. The accompanying soy and sesame sauce was too salty, but the pancake itself was delicious, a festival of textures and flavors. After stuffing ourselves silly, I needed more water, but I couldn't get the attention of any of the waitrons floating by. The one for our section seemed to have disappeared completely, and the others just ignored us. Finally, one came to set the table behind us and I collared her on the way past (she made the fatal mistake of looking our way). I got my water, and eventually, the check came. We did not tip as well as we ordinarily might have, but now that I think of it, the waitron still got almost 15%. I don't think this is the place we'll race to when we have a jones for Korean. But it was worth a shot, and for the most part, we enjoyed the food.